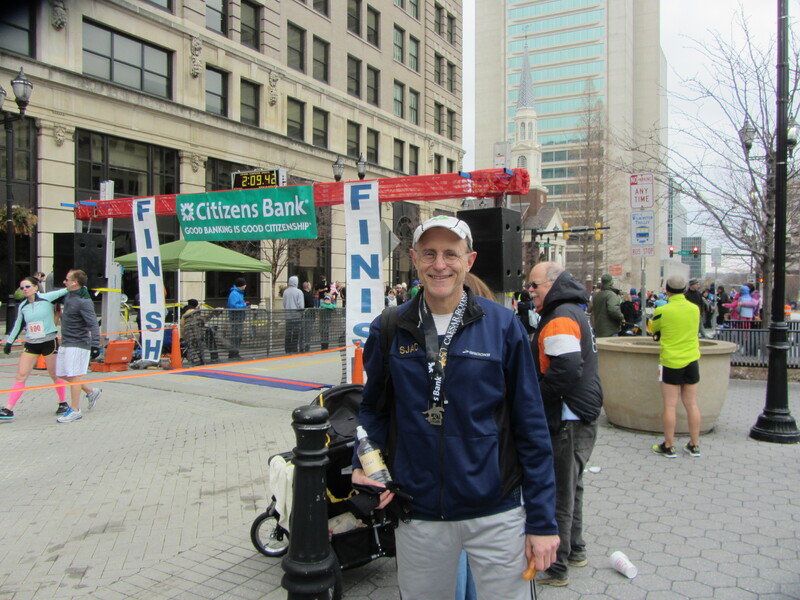 Last Sunday, March 17, 2013, was the fiftieth anniversary of the Caesar Rodney half marathon. This race has an illustrious history, especially since the half marathon distance only became a recognized distance in the early 1960’s with the earliest being the Route du Vin, in Luxembourg in 1961. The first Caesar Rodney was held April 5, 1964, making it among the first held in the United States. It was won that year by Browning Ross, from Woodbury, New Jersey, in 1:07:24. Browning Ross is known as the father of long distance running in America. He founded the Philadelphia Road Runners Club which ultimately became the Road Runners Club of America. He also started a newsletter, the Long Distance Log, in 1956, which provided running news to the relatively small and elite group of long distance runners at the time. I have run Caesar Rodney six times now. It was my first half marathon, in 2007, and aside from one Philadelphia Rock and Roll half marathon (formerly the Philadelphia Distance Run), my only half. The course is a tough one. It starts in downtown Wilmington, Delaware, at one corner of Caesar Rodney Square. It then proceeds south, slightly down hill, then flat, through a variety of neighborhoods, industrial areas, under the I95 overpass, and along a small tributary of the Delaware River. As the route passes back in to the downtown area of Wilmington, the course runs over a curb, along a small parking lot, and along a road where numerous church goers are trying to get to their church. The celebrants seem to have little forgiveness for the runners sacrilegious activity on Sunday morning. At this point, though, the runners are nearing the six mile mark and steeling their minds and bodies to the grueling 2.5 mile climb ahead. The ascent up Park Drive runs along a very attractive public park and another small tributary of the Delaware. Here is where the middle of the pack runners can see the ultimate winner, racing back down the hill already. At the apex, there is a turn through Rockford Park, and a gently hilly pass through a neighborhood. After that, the route heads back down the same Park Drive, a relief but still hard on the quads. The finish is particularly cruel, as the route turns steeply uphill to the top of Caesar Rodney Square. The finish line remains out of view as one takes a right, then another right, then a left to finally crest the climb and get to the line. My times over the last seven years have been remarkably consistent, with one outlier. Last year was a bad year for me in this race. I remember heading up that hill, head facing my feet, and thinking I was doomed. A youngish woman came bouncing beside me, no heel strike for her, and suggested I lift my head. I grumbled something about how my glasses were fogged and I needed to look down to see. The truth was I was grinding away and in no mood to be pleasant. This year, fortunately, the fog lifted. I held my head up the entire race, paced it well, and wound up with a PR. 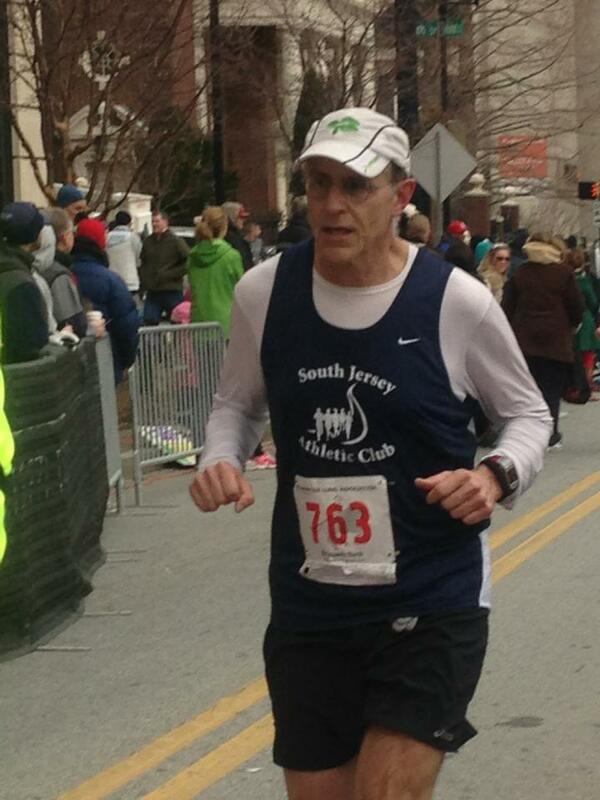 The honorable senator of Delaware, Tom Carper, age 66, ran the race, too, with bib #1, finishing in a very respectable 2:05:47. I watched as he crossed the finish line. I have great respect for someone as busy as he to take the time and make the major effort to run his hometown half marathon. We have a number of very fast runners in our club, the South Jersey Athletic Club, and we were well represented in this race. Dave Stewart ran 1:28:26. Brandon Hamilton ran 1:29:50. Joe Clark ran 1:30:49. Sixty six year old Joy Hampton came in first in her age group with a 1:55:16. After the race I was able to meet up with my son and his girlfriend who came out to watch. After grabbing a few apples, a couple of Clif Bar samples, and some Starbucks instant iced coffee samples (not yet the weather for it, though), we walked down Market Street to the only place open for breakfast, The Chelsea Tavern. It turned out we couldn’t have found a better spot. They had a brunch menu which was very creative. We managed to squeak in before several tables of fourteen runners got their orders in, which was probably very fortunate. I had T. A. Farms Turkey Benedict, with avocado salsa, which was a very nice and spicy turn of a standard. My son had some thick country fried scrapple, which turned out to be remarkably tasty, and his girlfriend had a delicious waffle. While they went for standard fare, the brunch menu also includes such items as Crispy Chili Spiced Pork Belly Benedict, Green Eggs and Spam Hash, with tarragon providing the green, and a Veggie Fritatta. The service was quick and friendly, and if you find yourself in downtown Wilmington in search of brunch, dinner, or a good beer, I highly recommend this place. We then made our way back to the car, the crews disassembling the finish line structure, and the tents and tables being removed. I believe next year I’ll be back. This race, while tough, has a way of drawing you back again.